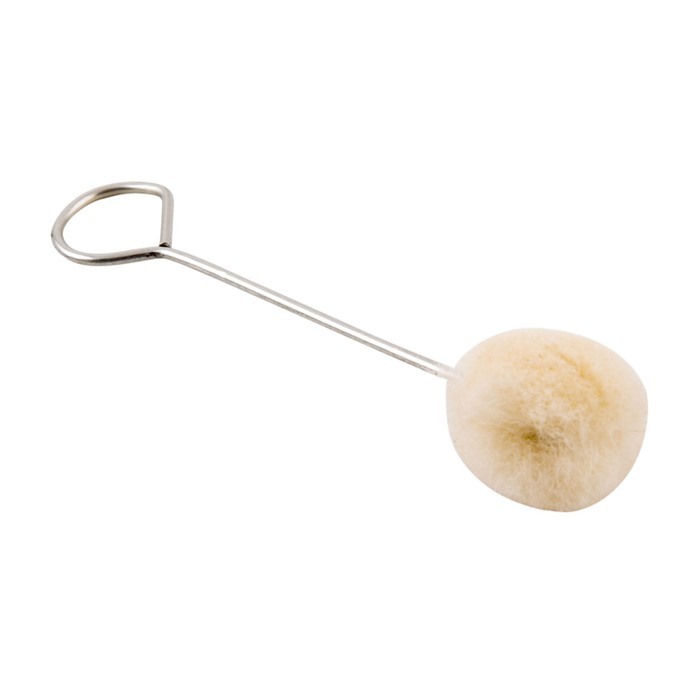 Large, wire-handled, dauber-type swab. Excellent for flooding on cold blues and many other shop applications. SPECS: ¾" (19.0mm) diameter, 3-½" (9.0cm) overall. Store, wire-håndteres, dauber-type vattpinne. Utmerket for flom på kalde blues og mange andre butikk programmer. Spesifikasjoner: ¾"(19,0 mm) diameter, 3-½" (9,0 cm) samlede. I couldn't get along in my shop if I didn't have the use of these swabs. Great for applying cold blue, helping to clean in hard to reach places. 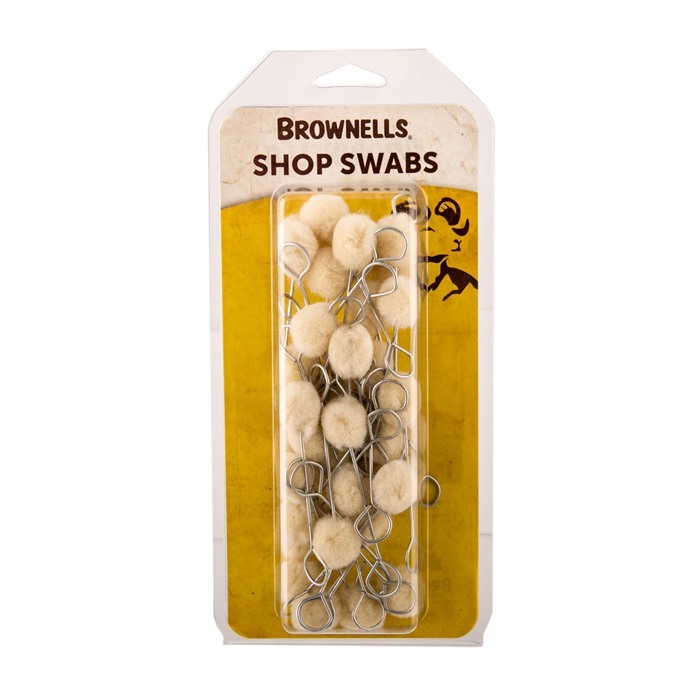 There are so many ways in which these swabs are helpful the list could go on and on. A great product. I have used various ways to apply rust bluing solution, and swabs like these are usually the easiest way to do it. I really like the size and shape, but I find these swabs less absorbent than other brands I have tried. As a matter of fact, they don't seem to be absorbent at all, so when wetting them you'll either get them too wet or too dry, they never seem to get just the right dampness that's required for a thin coat of rust bluing. I assume that this is because they are synthetic, cotton or some other absorbent fiber (for example, like the ones you get in some Birchwood-Casey kits) would work much better. On the plus side, they are easy to rinse and seem to keep their shape after cleaning and drying, which is not the case with other, more absorbent swabs. I use these exclusively to apply rust bluing solution. 8-10 drops of solution in an 'itty-bitty' cup which is tipped sideways to collect the solution in the corner and then gently absorbing the solution on the swab is about right for a double barrel set. After the solution is absorbed on one side of the swab I gently roll that swab side on the side of the cup to spread the solution out on the swab a bit. These are one-time uses for me then I discard the swab. I use these for cleaning inside the receiver of my rifles. The soft ball smashes down to conform to the machined cuts, and it squishes to a smaller diameter get inside a chamber. After cleaning with the swab I use compressed air to blow out the solvent - occasionally I have to repeat once on a really diry receiver. Wrap the ball lightly with 0000 steel wool and use Stoddard solvent to quickly remove rust in a receiver. Oil a swab, and then blot off the excess oil, and then use the swab to apply a light film of oil in the receiver. No downside to these that I have found. The last order of these swabs is very disappointing. They are obviously made of a different material than previous orders and have very poor absorbency. They are unusable for rust bluing as they 'wet' only at the point of contact with the solution and the solution remains concentrated in this small area. It was not possible for me to get thin applications of the rust bluing solution. They may be suitable for other purposes but are unsatisfactory for rust bluing. Very good for scrubbing out star chamber of M4 and ok in cleaning out the lower half of my semi-auto hand guns. BUT, they leave lint behind, need to follow-up with patches, rag and compressed air. (Thus only good for the 1st stage or two, but not final cleaning or oiling.) I seem to remember in the past, these were made with better, more natural material. just like the other reviews stated; these have changed over the years, they used to be great, now just meh. made from some kind of super cheap synthetic material that does not absorb oils or residue great and leaves lint behind like crazy. Just too bad they can not refine the material. only thing they are good for is the first stage of cleaning out a tight spot like the star chamber on a M-4. 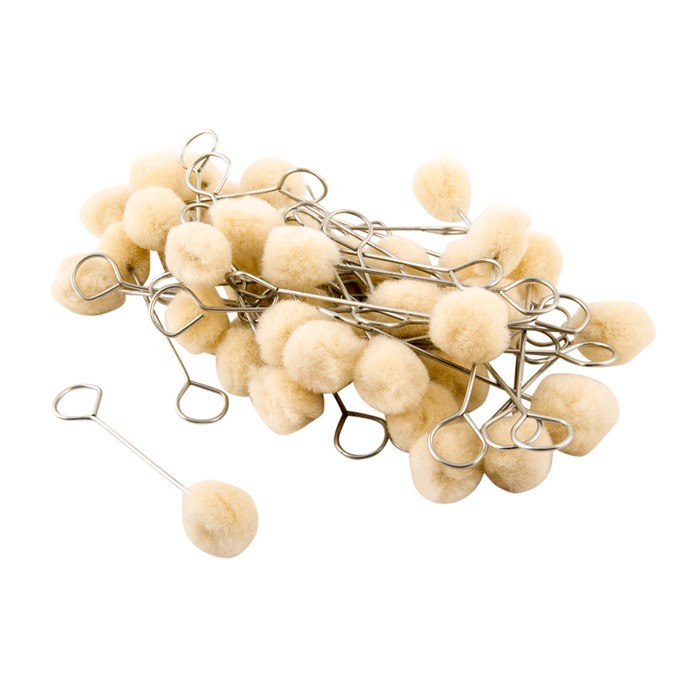 40 Shop Swabs 050806111011 Store, wire-håndteres, dauber-type vattpinne. Utmerket for flom på kalde blues og mange andre butikk programmer.